Here’s a companion piece to our previous ‘Dynamic Duos’ post. Many of these can also be used during the day but we find that they work really well with this night-time treats. 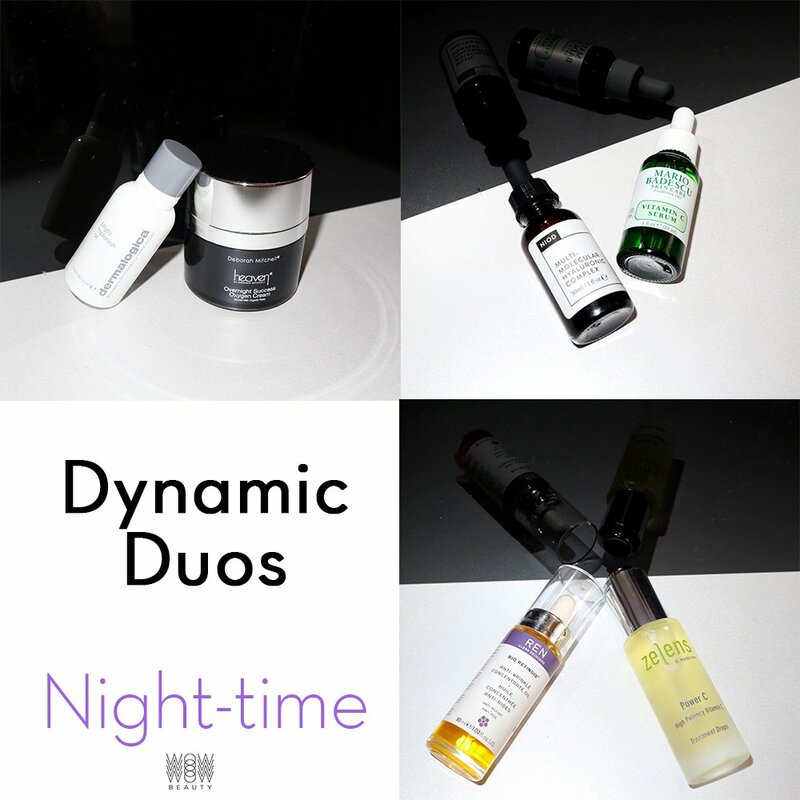 If you missed our post on daytime dynamic duos, you can see it here. This Dermalogica face oil is super light but super hydrating, it’s a real pleasure to use and leaves your skin gorgeously glowing and moisturised. It does this thanks to being packed with replenishing protective lipids that are depleted by ageing and environmental stress. First, phytoactives from Camellia and Tamanu oils help restore the skin’s natural barrier. Then, an essential lipid blend that includes Orchid Flower and Chia Seed Oil smoothes visible lines and locks in critical moisture. Finally, Sunflower, Rice Bran and Rosemary Extracts create a luminous antioxidant shield against free radical damage. Ideal for daily use on normal to dry skin and can also be used during the day if you wish! This works great when followed up with the Heaven Night Cream. The cream feels very nice going on, you really don’t need a lot of the product to cover your whole face. It’s not too thick, so it works well with a rich oil under it. Love the airtight container as it means the product will remain in perfect condition. It contains Panthenol which is used in pharmaceutical products to heal sunburns, so it works at repairing and healing the skin, with the Dermalogica locking in the moisture. This Mario Badescu Vitamin C serum is designed to be used at night. It has a very satisfying texture rather like a thin oil that’s easy to apply and leaves your skin with an instant glow. it is designed to brighten the skin, reduce discolouration and help to protect the skin from forming lines and wrinkles. This formula is 7.5% ascorbic acid plus Sodium hyaluronate and collagen are added to provide plumping and hydration. 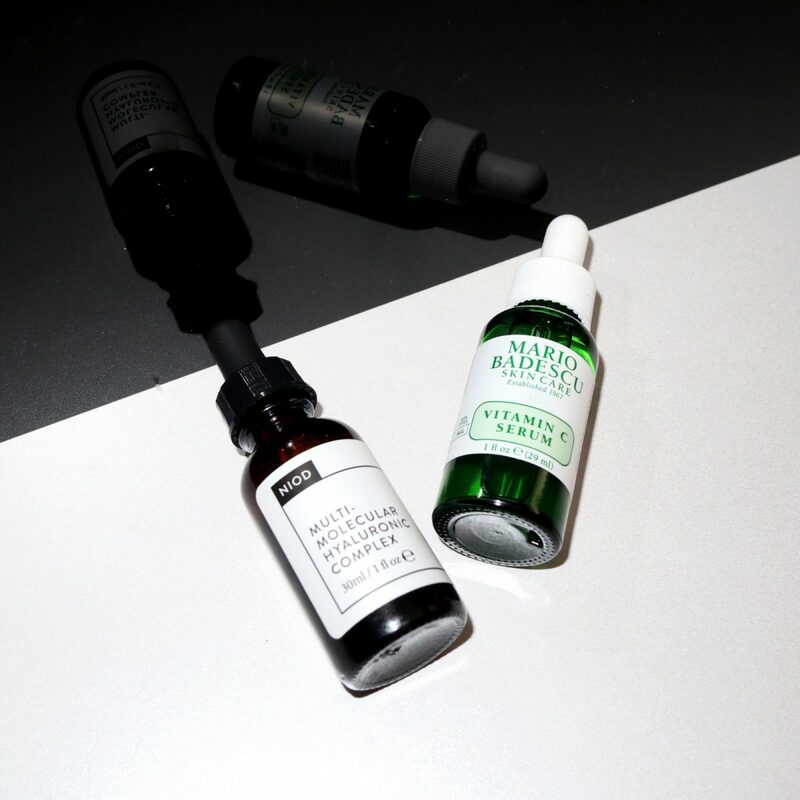 We’ve paired it with the Hyaluronic Acid serum from Niod as Vitamin C and Hyaluronic Acid make beautiful companions. We used this after the Vitamin C.
First of all, this contains not just 2 or 3 forms of Hyaluronic acid but 15 forms of Hyaluronic compounds as well. 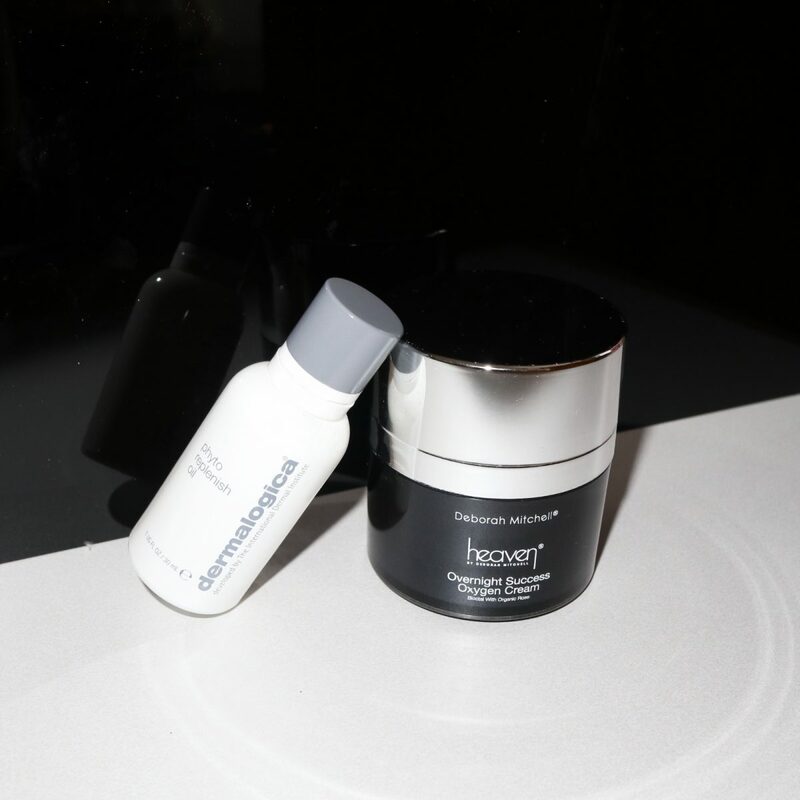 The brand says “hyaluronic precursors and a hyaluronic support technology in a peptide-charged delivery system. It offers water-based hydration and helps skin surface look plump, elastic, comfortable and uniform.” This means that if you suffer from dry skin or skin that doesn’t retain moisture well, your skin has a better chance of regaining a more hydrated appearance and greater elasticity with this blend. The next thing is that this delivers moisture in spades… you will notice a difference in the condition of your skin straight away. Our full review of the complex is here. The REN Bio-Retinoid Oil is lush and rich. It has a gorgeous mix of natural oils and vitamins designed to combat the appearance of ageing, smoothing and plumping the skin. Even though it’s an effective retinoid, it doesn’t irritate the skin or leave you feeling dry in the morning, which is known to happen with retinoid products. It also contains Omegas 3 & 6 to repair the skin and gives it more of a rich texture to it. It doesn’t feel heavy on the skin, just smooth a few drops on your face and night and you’re ready to go. Following this up with a Vitamin C serum would really help to improve the effectiveness of the Retinoid, and will help to heal the skin and will leave you with glowing skin in the morning. 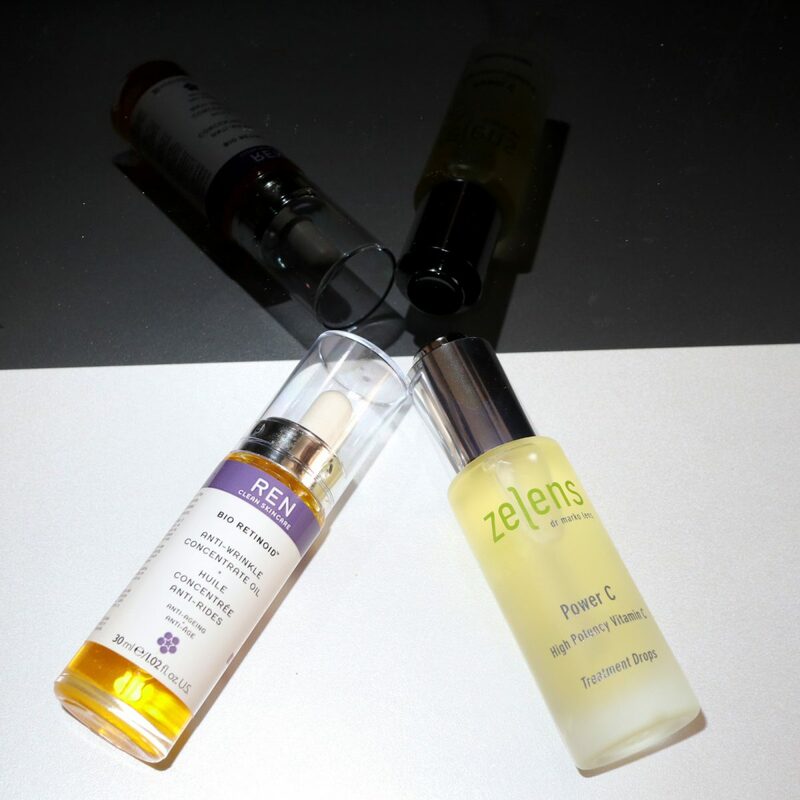 This luxuriously silky oil-based vitamin c serum from Zelens just glides onto the skin, making it feel instantly hydrated. This is formulated with 20% vitamin c making it super effective; Zelens uses “a stable oil-soluble form of Vitamin C (Ascorbyl Tetraisopalmitate) at 20% concentration. This ester boosts collagen production, brightens the skin by inhibiting melanogenesis (the production of pigment) and demonstrates strong antioxidant activity. Unlike ascorbic acid, Vitamin C ester will not exfoliate or irritate skin”. Other ingredients include omega 3 and omega 6 essential fatty acids, glycolipids, geranium oil and vitamin e. This can be used day or night.